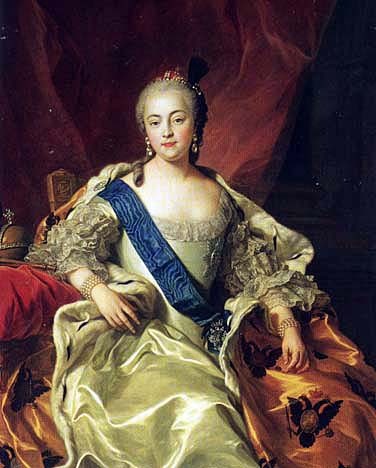 Catherine I was the empress consort of Peter the Great. After his death, she ruled, briefly, as empress in her own right, from 8 February 1725 until 17 May 1727, about sixteen months. Anna of Russia, Peter the Great's niece, was empress of Russia from 30 January 1730 until her death, 28 October 1740. After her death, she was succeeded--briefly--by her grandnephew, Ivan VI, but the one-year-old was overthrown rather quickly by Catherine I's daughter, Elizabeth. Elizabeth was empress of Russia for some twenty years, from 6 December 1741 until 5 January 1762. Catherine II of Russia--Catherine "the Great"--ruled the Russian empire for more than thirty years, from 9 July 1762 until 17 November 1796. In his essay on portraits of these empresses, John T. Alexander uses the term "Amazon autocratrixes"--love it!!!! The four women all had themselves painted as Amazons and, as Alexander explains "autocratrixes," they "all came to power via palace revolutions of varied sorts" and all four "maintained the idea (or fiction) of autocracy." The third of these empresses was Elizaveta Petrovna--or, more simply, Elizabeth, born in Moscow in 1709. Because her parents had married secretly in 1707, their marriage only made known publicly in 1712, her legitimacy would later be questioned, her marriage prospects nullified, her right to govern as empress challenged. Her father seemed to have cherished an idea that Elizabeth would marry Louis XV of France, and her education, supervised by a French governess, focused on European languages, social skills and etiquette, music, and riding. She was praised as a beauty and for her vivacity. 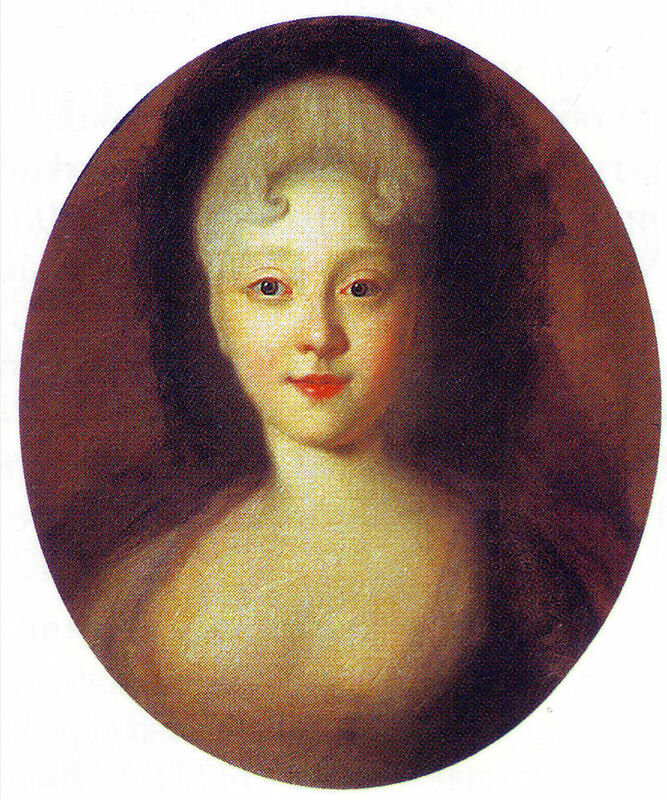 There is some indication that her father, Peter the Great, intended to name his older daughter, Anna, as his successor at the time of his death in 1725 (she had just been betrothed to Charles Frederick, duke of Holstein-Gottorp, their marriage taking place just months after the emperor's death). But the emperor had been unable to find a suitable match for his younger daughter, Elizabeth, before he died--perhaps, in part, because of lingering questions about her legitimacy, the Bourbons had rejected the idea of a match with the French Louis. After her mother's brief reign as empress of Russia as Catherine I, Peter II became the emperor--he was Elizabeth's half-nephew. (Catherine had been Peter the Great's second wife--Peter II was Peter the Great's grandson, the child of his son by his first wife.) Although Elizabeth was named as joint regent for Peter II, just twelve at the time, court politics and intrigues kept her from any real power or influence. But after Peter II's brief reign (1727-30), Elizabeth suffered once Anna assumed the throne of Russia. No marriage possibilities were considered--so Elizabeth began a series of affairs, with the empress threatening to send her to a convent. Elizabeth's finances were cut, and she was kept under surveillance, but during this time she also gathered support. Once she became empress, and despite the fact that she had not been trained to rule, Elizabeth's tact, good judgment, and sense of diplomacy ensured her successes. She reorganized the government, refocused Russia's foreign policy, supported educational and cultural developments (under her reign the first university was founded in Russia, and she founded the St. Petersburg Academy of Sciences). She abolished capital punishment, patronized artists, architects, composers, and writers, hosted lavish pageants and parties, and spent a lot of time and money on elaborate clothing, including menswear. In her 1970 biography of the empress, historian Tamara Talbot Rice recorded this description of Elizabeth: "the laziest, most extravagant and most amorous of sovereigns." Given all the horrors of so many rulers throughout history, I'd say this assessment wasn't bad, all things considered. Elizabeth of Russia never married. Well aware that the deposed Ivan VI might be used as a puppet ruler after her death, she selected her nephew, Peter of Holstein-Gottorp, as her heir. He was her sister Anna's son, though Anna had died when the boy was just a few months old, his father when the boy was eleven. In 1742, she proclaimed him heir and brought him to St. Petersburg, where he was given Russian tutors and a bride, his second cousin Sophia Augusta Frederica, who was renamed Catherine. On her death, Elizabeth was in fact succeeded by her nephew--but Peter III was only emperor of Russia for six months. He was forced to abdicate, succeeded by his wife, Catherine--you know, the one who became Catherine the Great. There are several well detailed biographical essays about Elizabeth of Russia online, including John T. Alexander's entry from the Encyclopedia of Russian History and Olga Prodan's entry on Elizabeth Petrovna Romanovna from the online Russiapedia. There are two out-of-print but widely available multiple biographies: Philip Longworth's 1973 The Three Empresses: Catherine I, Anne, and Elizabeth of Russia and Robert Coughan's 1974 Elizabeth and Catherine: Empresses of All the Russias. Rice's seems to be the only individual biography--but used copies are readily available of this as well as of the Longworth and Coughan books.